The Parish and Kirk of Kirkmichael has of old been associated with the Urquharts. There is an Urquhart charter of 1349 of land within the parish, and many subsequent charters over several centuries deal with lands within the parish and Kirkmichael itself as they moved into and out of Urquhart ownership. The Urquharts of Cromarty and related branches were the proprietors for a long period of the whole parish of Resolis (the united parishes of Kirkmichael and Cullicudden). The Urquharts of Kinbeachie are buried in Cullicudden but the Urquharts of Braelangwell and the Urquharts of Newhall are buried in Kirkmichael. This superbly carved Urquhart of Braelangwell (William Urquhart) wall panel (left) can be seen in the chancel of Kirkmichael kirk. The Urquharts of Newhall were a very important branch in their time, having an extensive estate of about 9,000 acres of land. In 1678, Colonel Alexander Urquhart of Newhall with his son John and the Laird of Cromarty were Commissioners to the Scottish Parliament. Both Alexander and his son John were buried at Kirkmichael, but the location of their graves has not been traced. 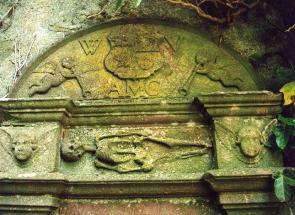 Colonel William Urquhart of Braelangwell (1660-1708), is buried in Kirkmichael. His son Charles Urquhart of Braelangwell (1699-1776) is also buried at Kirkmichael. Charles is frequently mentioned in the Letterbook of Baillie James Steuart. David Urquhart of Braelangwell (1748-1811), the son of Charles, married twice, firstly in 1786 Henrietta Gordon of Newhall (died 1799, buried Kirkmichael - after whom Henrietta Park is named), widow of Thomas Lockhart, and secondly in 1804 Margaret Hunter (died 1839), joint heritor of her brother, a wealthy Edinburgh merchant. Colonel Charles Gordon Urquhart of Braelangwell (1788-1828), the only son from that first marriage, was unmarried when he died when a shed collapsed on him in Greece, on the island of Karabusa where he was Governor. Formerly an officer in the Scots Greys, he had sold the estate with the exception of a small portion including the ancient burying ground of Kirkmichael, which, having descended in strict tail, became the property of his half-brother David. Braelangwell came into the possession of the family of Fraser. Interestingly, Isabella Fraser of Braelangwell (-1862) married the eighth Urquhart laird of Meldrum, Beauchamp Colclough Urquhart (1830-1896).The diplomat David Urquhart was born at Braelangwell, the second son of David Urquhart of Braelangwell, by his second wife, Miss Hunter. His father died while David was still a child [he died in 1811 and Braelangwell was rouped in 1812], and he was brought up by his mother. He was active in the military, including being in the Greek service, and held numerous important diplomatic positions, including several in Constantinople. His outspoken views led to him falling out of favour on several occasions. He powerfully influenced public opinion by his numerous writings, mostly on international politics and international travel. His style was admirably lucid. Interestingly, Urquhart was responsible for the naturalisation of the Turkish bath in the British Isles through his enthusiastic report of the institution in his 'Pillars of Hercules' in 1850 and subsequent lectures. One of the most colourful and romantic Scottish characters, Sir Thomas Urquhart of Cromarty (c 1610 - c 1660), was the patron of Kirkmichael, Cullicudden and Cromarty. Mathematician, author, translator and soldier, he left his home to fight for the royal cause and was captured at the Battle of Worcester. While in the Tower of London, he tried to persuade Cromwell to free him by promising to deliver various achievements such as a universal language, and impressing him with his genealogy, whereby he tracked his parentage back through genuine forbears and real and mythological kings to Adam and Eve. He was the eldest son of Sir Thomas Urquhart of Cromarty and Christian, daughter of Alexander Lord Elphinston. The curacies of Cullicudden and Kirkmichael were in the gift of the Urquharts of Cromarty. Thomas Urquhart Urquhart was harassed by creditors and by the local ministers, who attacked him for his Episcopalian views. 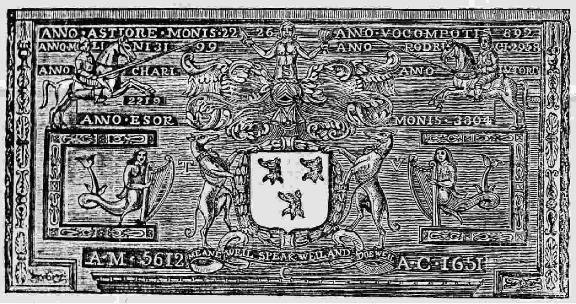 One of Urquhart's greatest claims to fame should be the following piece of text, again drawn from The Jewel (1652). It is part of what must surely be the most sustained piece of invective in the English language. And it is directed in general at Presbyterianism, and specifically at one minister of Cromarty and, to draw out eventually the reason for its inclusion here, at the ministers of Kirkmichael and Cullicudden. The following is a description of the lands and estates of the Urquharts in Ross and Cromarty shires, as contained in an instrument of sasine in favour of Sir Robert Farquhar in 1644:- All and whole the lands and barony of Cromarty, comprehending the lands and dominical lands or mains of Cromarty, with the tower, fortalice, manor place, houses, biggings, yards, orchards, and pertinents thereof, together with the heritable office of Sheriff of Cromarty, with all the privileges, liberties, fees, casualties, and duties whatsoever pertaining and belonging to the same. The towns and lands of Newtoun, Navity, and Neilstoun, and the houses, biggings, yards, orchards, parts, pendicles, and pertinents of the same. The burgh lands, roods, and acres of Cromarty, as also with the advocation, presentation, and right of patronage of the parish church and parish of Cromarty. The town and lands of Farness, with the mills, mill lands, multures, sequels, houses, biggings, yards, orchards, parts, pendicles, and pertinents of the same, Bostas of Farness and Bannans, the towns and lands of Davidston, Peddiesten, Ardoch, Bellaskellie, Braelangwell, Bellacherrie, Resolis, Ferrietown, Belblair, Roskobbrechtie, the Milltown of Roskobbrechtie, with the mills, mill lands, multures, and sequels thereof. The ward of Gelnie, Teminich, Auchmartin, and Corrie, the towns and lands of Meikle and Little Braes, with the woods thereof and the towns and lands of St Martin's, with the mills thereof, houses, and biggings of the same, together with the teind-sheaves, and other teinds, parsonage and vicarage of the whole foresaid towns and lands, with the pendicles and pertinents of the same, as also, with all and singular, the towns, fortalices, manor places, houses, biggings, yards, orchards, mills, mill lands, multures, sequels, woods, fishings, tofts, crofts, outseats, inseats, muirs, marshes, meadows, annexis, connexis, dependencies, tenants, tenantries, and services of free tenants, parts, pendicles, and pertinents of the whole foresaid towns, lands, and barony - all lying within the parish of Cromarty and Kirkmichael, and sheriffdoms of Cromarty and Inverness, respectively aforesaid. All and whole the lands of Udoll, Little Farness, Cullicudden, Culboes, Woodhead, the towns and lands of St Martins, with the mills, mill land, multures, sequels, houses, biggings, yards, orchards, parts, pendicles, and pertinents, with the advocations, donations, and rights of patronages of the parish churches and parishes of Cullicudden and Cromarty. The lands of Kinbeachie, with the mill, mill lands, multures, sequels, and pertinents, all lying within the said parishes of Cullicudden and Cromarty respectively, and sheriffdom of Inverness foresaid. All and whole the towns and lands of Pittogertie Pitnellies, Bellacouth, Inverethie, lying within the parish, and county of Invernes, foresaid, together also with the teind-sheaves, and other teinds, parsonage, and vicarage of the whole foresaid towns and lands, with the pendicles and pertinents thereof; likewise, with all and singular, the towers, fortalices, and manor places, houses, biggings, yards, orchards, mills, mill lands, multures, woods, fishings, tofts, crofts, outseats, inseats, muirs, marshes, meadows, annexis, connexis, dependencies, tenants, tenantries, and services of free tenants, parts, pendicles, and pertinents of the whole foresaid towns and lands.